By far one of the easiest ways to dose balanced solutions calcium, alkalinity, and magnesium along with all other major and minor elements corals will need for health and vitality. The proportions are based on the Balling Method and can be dosed manually or through a dosing pump system. 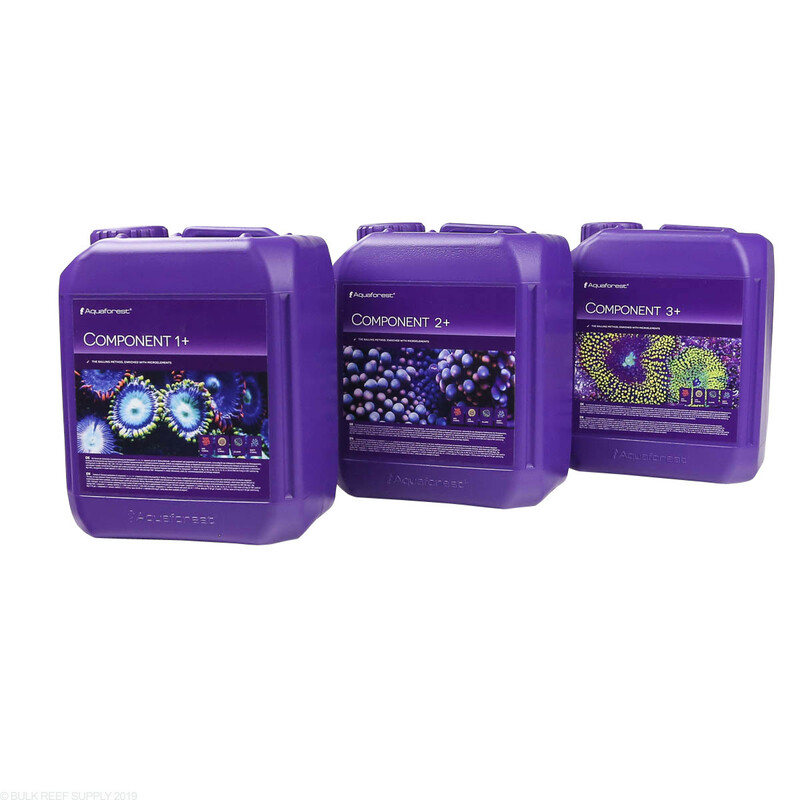 If you use a system like the Probiotic or Balling system, you will want to give the Component 1+, 2+, 3+ system a try for the addition of essential elements. It is by far one of the easiest systems to hook up to a 3 pump dosing system to maintain all major and minor trace elements in a reef tank. Each component contains a balanced mixture of elements that blend well together, and will not precipitate in the storage jugs. Tip: By drilling a hole in the removable top on the jugs and purchasing a few 1/4" tank adapter bulkheads and 1/4" clear acrylic tubing will let you connect standard dosing pump tubing directly to the jugs. 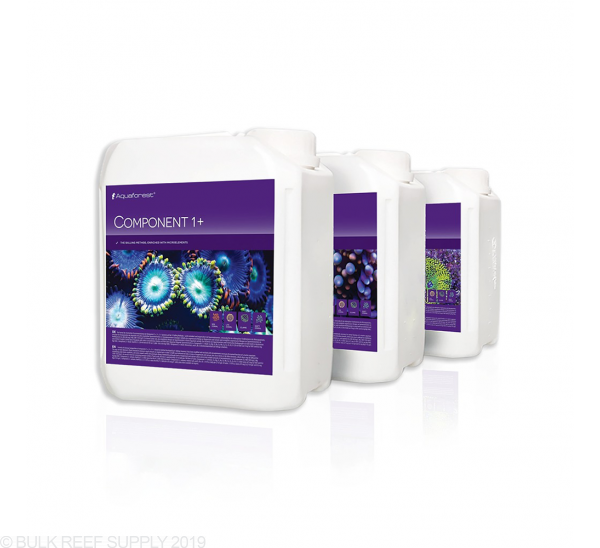 Dosing will vary per your aquariums demand for trace elements. For an average reef tank, the starting dose will be around 50 mL for every 100 liters (27 gal) of aquarium water (per component every day). We suggest testing your calcium, alkalinity, and magnesium levels for proper stability and adjusting accordingly. Note: Dosing components too quickly together may cause precipitation. We recommend 1 hour between each components addition, helping prevent elements from falling out of solution. Component 1+ contains: Ca, Sr, Ba, Co, Mn, Cu, Fe, Zn, Ni, Cr. (50mL dissolved in 27 US gal raises Ca by 9 mg). 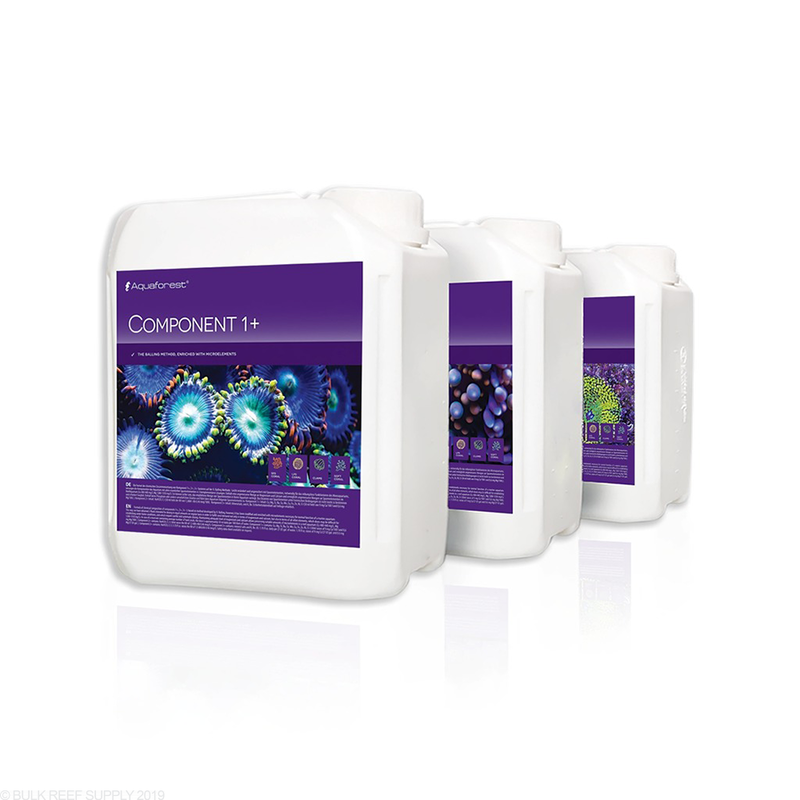 Component 3+ contains: Mg, Reef Mineral Salt, K and B. (50mL dissolved in 27 US gal raises Mg by 0,6 mg). Corals love this stuff! Easy to dial in and trace elements help corals color up. Makes life easy! i switched from red sea foundation elements to aquaforest component 1+2+3+ in my red sea max nano reef a couple of weeks ago. since i was already dosing, i knew roughly how much alk was being consumed, so i had a starting point. i am currently dosing 28ml of each (3.5ml of each 8x/day), and my params have been rock solid since i switched. i even switched to regular instant ocean salt (not reef crystals) from red sea coral pro salt, since i am dosing calcium, alk, magnesium, and all other necessary trace elements with aquaforest. so far so good, and stable as can be. Love this product, once you get the proportions right. It keeps levels steady and salt levels right. Great growth color and ease. Got it down to almost two months on an order, on a 125 gal tank and 35 gal sump. Love this stuff so do my corals, biggest problem it’s never in stock! Been using for 6 months, definitely colored up allot of corals only downside is that it is not as strong for alk as most two parts, I probably use twice as much to keep my l levels constant, so I have been mixing a very small amount of kalk in my ato which helps allot!! I’ve only been using this product 3 weeks so I can’t say to much yet but I’ve noticed it has really help with coloration so far. -Easily and expectedly. Also, you can’t trust reviews that have obvious typos. There is no reason for that in 2018 with spell check. Great stuff BRS. This item always sells out because it works. Been utilizing this program for 1 month and the wow factor speaks for itself. My recommendation is to start with 1/3 the suggested dosage so you do not spike you ALK. Test daily until you got it dialed in. Adjust as your ALK will drop indicating growth. 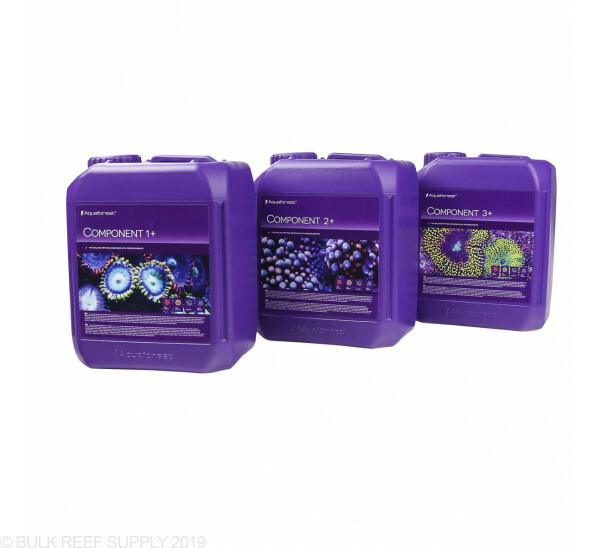 This is a great product i have seen amazing result in my mixed reef. My corals have been growing and the colors are great. i keep getting compliments on my tank and everyone keeps asking what are you using. i tell them aquaforest because its the truth. This is the easiest most straightforward product Aquaforest makes. Perfectly balanced your dosing needs. Great growth and coloration! Thanks for reaching out to us! The containers are 7x6x9". Please let us know if you have any further questions!